Welaunee Plantation will be developed. Not this year, and perhaps not next, but sometime. The plans have already been drawn up--roads, bridges, trails, and an I-10 interchange. A large piece of the land has already been conserved as the Miccosukee Greenway, and more will. In the meantime, though, athletes in Tallahassee, Florida, can tour pre-development Welaunee once a year in the Run For Lawson. 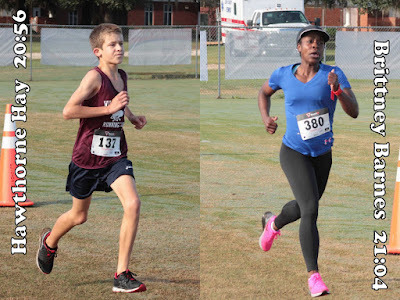 The fifth annual Run For Lawson was on Saturday morning, 26 September 2015, featuring a 10K, a 5K, and a one-mile fun run, all starting from Holy Comforter Episcopal School. Tallahassee master runner Mike Peymann won the longest race, covering the 6.2 miles in 41:03. Jimbo Halley of Tallahassee was second in 42:06, followed by Tallahassee runners Hal Fravel (3rd, 44:05) and Justin Poole (4th, 44:54). Right on Poole's heels was the first female finisher, Leslie Dickinson. Ever since the 10K was added to the Run For Lawson in 2012, the women's records haven't lasted long. Allison Thumm established the original record of 52:00, it was broken a year later in 2013 by Renee Cox with a 45:53. Cox's record was broken in 2014 when Jillian Heddaeus ran 45:32. Dickinson kept up that string of short-lived record, knocking off Heddaeus' mark with a 44:56. A Sudbury, Massachusetts, runner, Dickinson was fifth overall. Tallahassee's Juanita Chalmers was second in the women's standings, coming in seventh overall in 47:33. Paticia Reddick of Fall River was the first woman master and third female finisher, ninth overall in 48:08. 2014 women's champ Jillian Heddaeus was fourth in the women's division, finishing tenth overall in 48:19. 98 athletes finished the Run For Lawson 10K. The Run For Lawson came during a two-week break in the Leon County Schools' middle school cross country schedule. Montford harrier Hawthorne Hay took advantage of that break to win the Run For Lawson 5K, running 20:56. Not far behind the Montford eighth-grader, Brittney Barnes finished second overall in 21:04, taking the women's title. Nick Trombetta was third overall in 21:35. Trombetta was followed by two more Montford cross-country runners--eighth graders Caitlin Wilkey (4th, 21:36), the second female finisher, Sam Hartman (5th, 21:56), the third male finisher. Ramsay Sims was the fastest master runner in the race, the fourth male and sixth overall in 22:24. Montford eighth-grader Bryce Workman was seventh overall in 22:37. Third in the women's standings went to Maia Mast (10th, 23:33), a Cornerstone Learning cross-country runner. 226 runners and walkers finished the Run For Lawson 5K. Nicole Sivyer 5K Rugger Run. 9:00 AM ET. Florida State University Integration Statue, 75 North Woodward Avenue, Tallahassee, Florida 32313. Online registration at RunSignUp.com. Pelham Wildlife Run 5K and one-mile fun run. 8:00 AM ET. Pelham High School, 720 Barrow Avenue, Pelham, Georgia 31779. Event web page. Entry form and flyer. Online registration at RaceIt.com. Carol Shiver, carolshiver430@gmail.com or 229-328-6147 or 229-294-2341. Ashburn Women's Club 5K and one-mile fun run for Macy Rae. 8:00 AM ET. Turner County Specialty School, 330 Gilmore Street, Ashburn, Georgia 31714. Online registration at EventBrite.com. 4th annual BARC 5K9 Trail Run. 8:00 AM ET. Freedom Park, 3795 Guest Road, Valdosta, Georgia 31605. Event page on Facebook. Online registration at active.com. ApalachOktoberfest Brät Trot 5K. 8:00 AM ET. Bowery Station, 252 Water Street, Apalachicola, Florida. Event web page. Entry Form and flyer. TMH For Life Challenge October 5K and one-mile fun run. 9:00 AM ET 5K / 9:15 AM ET one mile. Canopy Oaks Elementary School, 3250 Point View Drive, Tallahassee, Florida 32303. USATF certified course. Event page on Facebook. Online registration at EventBrite.com. Tonya Smith, Tonya.Smith@tmh.org or 850-431-4828. Zeta Tau Alpha's 21st annual Race To Live 5K. 9:00 AM ET. Zeta Tau Alpha, 514 West College Avenue, Tallahassee, Florida 32301. 2011 story. 2010 story. Event web site. Entry form and flyer. Online registration at EventBrite.com. 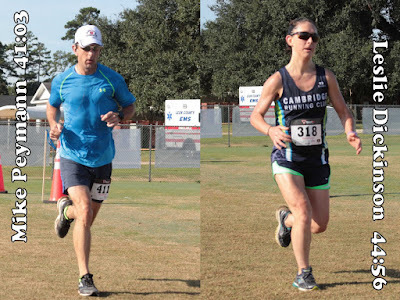 Bainbridge-Decatur County YMCA Veteran's Day 10K, 5K, and one-mile fun run. 9:00 AM ET 10K and 5K / 9:15 AM ET one mile. Bainbridge-Decatur County YMCA, 1818 East Shotwell Street, Bainbridge, Georgia 39819. 2011 story. 2010 story. Entry form and flyer. Bainbridge, Georgia 39819. 229-243-0508. Tulip Trot 5K and one-mile fun run. 8:30 AM ET one mile / 9:00 AM ET 5K. Cascades Park, 1001 South Gadsden Street, Tallahassee, Florida 32301. 2015 story. 2011 story. 2010 story. USATF certified course FL14149EBM. 4th annual Fishnet 5K. 8:00 AM ET. Florida State University Integration, 104 North Woodward Avenue, Tallahassee, Florida 32313. 2015 story. 2014 story. 2013 story. Event page on Facebook.